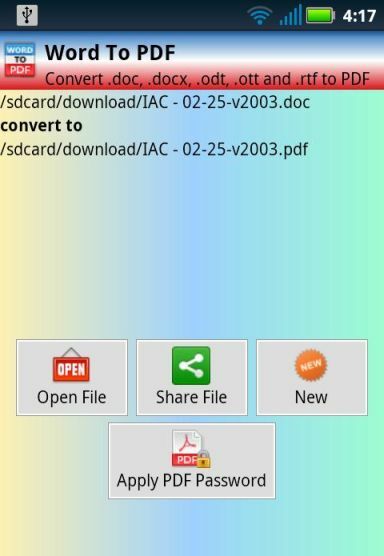 How to Convert Word Files to PDF in Android? Android is the most popular mobile operating system now and it grows with millions of apps, games, books and more. Some Android devices do not provide the feature of office suite to view or read MS-Word documents. So you cannot read doc or docx files within Android, you need to find alter way to do this. You can read Word documents by converting them to PDF files. PDF is the best and universal format that can be used in various devices. After the conversion you can view the document from Adobe Reader or any PDF readers for Android. First you need a Converter app for Android, so you can download Word to PDF converter app developed by Thinkti.com.br website. The app starts with Select File button, you just click on it and select any Word file. Then click the convert button to upload the file and convert the file online. Converting time will be depending on your file size. After a few seconds you can download your converted file easily. Perfect support conversion from DOCX. Best conversion from DOC, read images, graphs, tables, etc. Share converted files instantly through Bluetooth and Email. It works online but does not store or use any personal data. Word to PDF app available for free to download on Google Play. It comes with ads and you can purchase the ad-free version if you need. Also the developer offers more variety of apps including Excel to PDF, Powerpoint to PDF, Word to TXT, Excel to HTML, Powerpoint to Flash and more. You can see these apps under the download page.